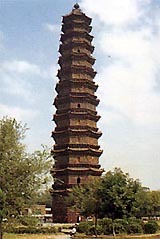 The Iron Pagoda in the northeastern corner of Kaifeng City was erected in 1049, the first year during the reign of Emperor Huangyou of the Song Dynasty. Laid with brown glazed bricks, it looks like a pagoda cast with iron, hence its name. It towers 55.08 meters in height.